his worksheet gives kids practice in calculating volume, a basic skill for geometry and upper-level math. Volume is the measurement of space occupied in three dimensions. 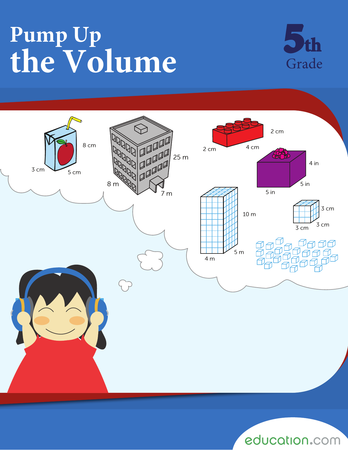 Practice calculating the volume of 3-D shapes using a variety of techniques and with real-life examples through a series of engaging problems and questions. Assess your students’ knowledge of fifth grade data and measurement concepts. This worksheet will challenge students’ understanding of volume and the equation l x w x h = V. Then, once they solve the equation have them draw the 3-D objects. The objects will all be rectangular prisms. This introductory worksheet provides some support when calculating the volume of rectangular prisms. With a clear illustration and instructions, this exercise will teach students how to calculate the seemingly complex volume of a rectangular prism. Write the missing values for the length, width, and height of each cube. Cut out and assemble the unfolded shapes, then calculate their volumes! 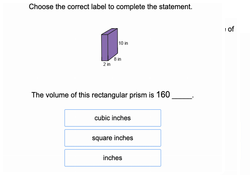 With this worksheet, your students will calculate volumes of rectangular prisms. What Do Cubes Have to Do with Volume? Find the volume of each figure by counting up how many cubic units were used to make each figure. With this activity, students will model a rectangular prism and calculate its volume. 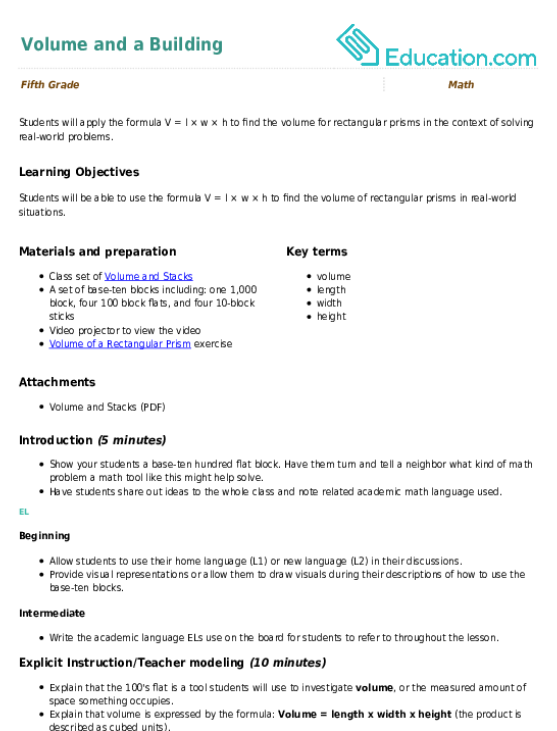 Use this worksheet to introduce, reinforce, and review geometry skills like modeling and solving. Use sugar cubes, ice cubes or blocks to build each cube or rectangular prism. Then, count up the cubes and write down the volume. Students will apply the formula V = l × w × h to find the volume for rectangular prisms in the context of solving real-world problems. Have you ever shaken a present and tried to guess what might be inside? With this worksheet your students will calculate the volume of Christmas presents to make logical guesses as to what might fit inside the box. Calculating the volume of rectangular prisms is a new skill that is introduced in 5th grade. Students will apply mathematical formulas to find the volume of different kinds of figures and also determine the volume of a figure composed of two connected rectangular prisms. Learners will also work with other kinds of measurement when they make larger or smaller versions of figures (to scale) and learn to convert measurements. Help your students visualize rectangular prisms with this exercise. Students will practice modeling rectangular prisms and calculating the volume of each shape using the formula.